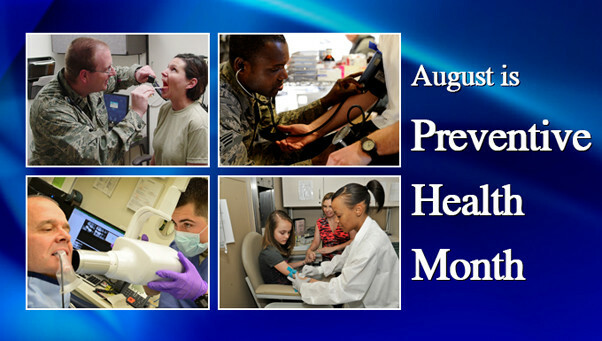 FALLS CHURCH, Va. — Preventing illness or injury is the goal of the Air Force’s Preventive Medicine program, a topic that is highlighted in August during Preventive Health Month. Preventive Health extends beyond health care at an individual level, concentrating rather on the health of individuals, communities and specific populations to help groups reduce their risk of disease, disability and death. Preventive Health breaks down into three separate stages: primary, secondary, and tertiary. Primary prevention is meant to keep people from getting sick in the first place. There are many ways to do this from immunizations to targeting exposures that might get people sick. The Air Force’s Health Promotion effort focuses on primary prevention, too. 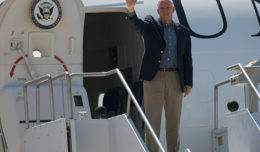 In addition to advocating for new policies that make it easier to adopt healthy habits, such as improving dining facilities to offer healthier foods, Moore said they also create campaigns to promote the adoption of healthy behaviors like eating right and not smoking. They also work to keep Airmen from unhealthy behaviors. 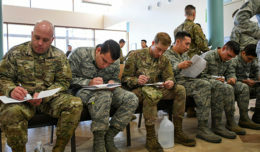 Preventive Health’s secondary stage is the one most Airmen have experienced in one way or another. It includes things like the annual Periodic Health Assessment, hearing tests, cancer screenings, and blood tests. While it mostly works behind the scenes, Population Health plays a big part in the secondary stage by using data from military treatment facilities around the Air Force. “Once we identify areas we do well in and areas we have challenges in, we deep dive into more investigative work and see how we can improve,” Monahan said. One example of how Population Health improves preventive health is with breast cancer screening. Using the data available, Monahan is able to find a group of patients that should be receiving that screening based on their gender, age and other factors. He can then push for outreach campaigns to help make sure those people are getting that recommendation. The final stage is tertiary prevention. At this point an individual already has a disease, but it’s still in a stage that’s early enough to treat. A good example of this is diabetes, which can be treated with a change in diet and nutrition long before it gets to the point where medicine is needed. Moore said many of the factors that have led to an increase in life expectancy for humans can be attributed to the concept of preventive health. Things like improved sanitation and just getting people to wash their hands have made a huge difference to public health overall because it has prevented people from contracting diseases they may have gotten otherwise. 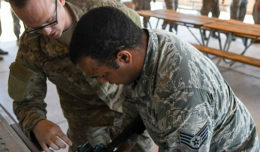 Preventive health covers topics ranging from the flu shot to tobacco cessation to alcohol consumption, and the Air Force is exploring new avenues for all of these issues. Throughout August, our site will cover all these topics and more while expanding on Preventive Health.